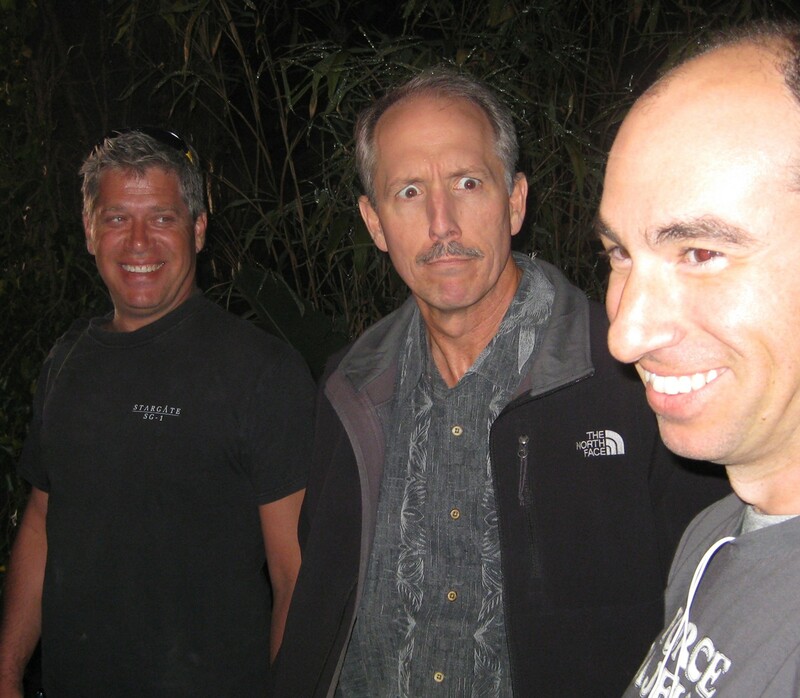 Joseph Mallozzi's Weblog: July 28, 2009: My Triumvirate of Terrificness! Elyse Levesque! An Episode Title Revealed! July 28, 2009: My Triumvirate of Terrificness! Elyse Levesque! An Episode Title Revealed! Well, second day back at work and no work completed. On the script front that is. Production has, however, started on Faith (Episode 13) and we have watched two of the three episodes that make up my Triuvirate of Terrificness, my Top 3 favorite episodes of the season. So far. Yesterday, we watched the director’s cut of Divided (Episode #12). It’s tight! First-time Stargate Director Felix Alcala hits a home run, directing a riveting and incredibly compelling episode scripted by my fellow producer and writing partner Paul Mullie. Tense, thrilling, occasionally surprising, with some wonderful moments for all of our cast members. Then today, we watched the Day 1 Mix of Life (Episode #8). 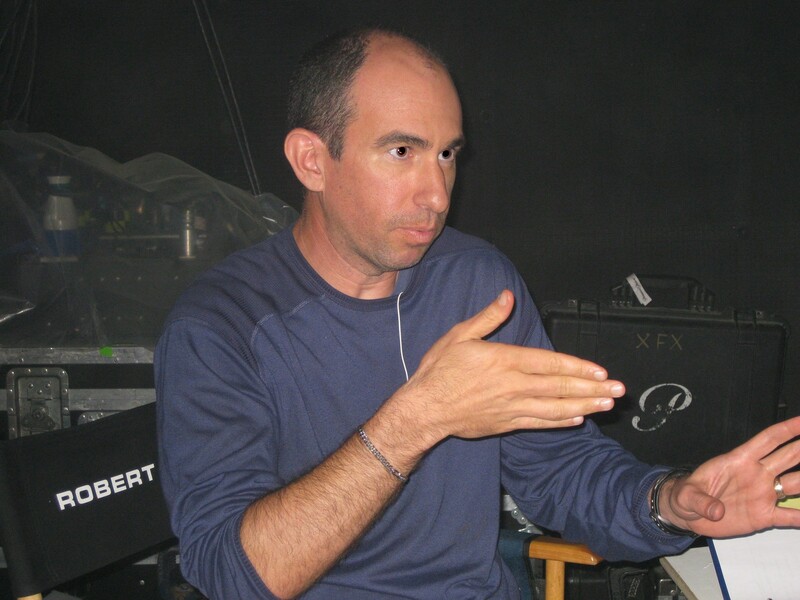 Director Alex Chapple, another Stargate newbie, delivers big time with an episode that explores the hidden lives of our characters. Some incredibly warm and touching performances in this one. Of all the romances, potential and otherwise, the Camille-Sharon relationship is the one that resonates the strongest with me. Every time I watch this episode, I always get a little, uh, dust in my eye watching their scenes. Kudos to Carl Binder who wrote the brilliant script and kudos to Joel Goldsmith who continues his winning composedly ways with a truly beautiful score. Oh, and if you’re wondering, the third episode in my personal Triumvirate of Terrificness is Time (Episode #9) – a Rob Cooper Joint. Freaky, fun, and very clever. More than any other episode (outside of our premiere of course), I anxiously await the fan reaction to this one. Shooting in the jungle’s of Time. Director Robert Cooper breaks down the scene for us. Well, we’re past the halfway mark on season one and our cast continues to impress. Yes, yes, they’re supremely talented – I’ve said it on more than one occasion – and you’d think we’d get used to it by now but, every time we think they can’t get any better, they surprise us with a line interpretation, delivery, or scene that will have us (the producers) giddy with delight. And it’s not just two or three of them. This cast is solid straight through, from veteran Robert Carlyle to recurring actors like Peter Kelamis and Patrick Gilmore who have taken their characters from supportive roles to fully-fleshed out and engaging players. I’d also like to make mention of one of our youngest actors, Elyse Levesque. The part of Chloe Armstrong was one of the last cast because, quite frankly, it’s a very tough role. This is a character with a significant emotional and intellectual depth beneath her privileged exterior and we needed to find someone who could pull it off with range and a certain amount of subtlety. And after watching the dailies of the two-part opener, Air I and Air II, I can honestly say I can’t imagine anyone better for the role. Elyse consistently demonstrates the sort of talent that will make people take note – fans, critics, and producers alike. Her Chloe is smart, sympathetic and incredibly charming. Much like the actress herself. As promised in yesterday’s comments section, I reveal to you the title to Episode #19. Those of you who guessed Subversion – guessed correctly. Previous Article July 27, 2009: Happy 1000! Next Article July 29, 2009: My Culinary Odyssey Draws Ever Closer! Episode Updates! The Hyrdoponics Lab! Whoa! What’s up with Rob’s eyes in the third picture down? Have you taken a page out of Scalzi’s book and started Photoshopping? good title, I feel that Rush , will tear brothel among the crew. A good idea for humoristic. Why you don’t integrate a pet on the crew.???? Hey Mr M. I’d like to start off by saying I’m a huge fan of the SG franchise, and the teasers and pictures of SGU that are out there have me really hyped for the premiere. 1) Are all of the gates seeded by the original ship almost identical to the one on the Destiny, and are they seeded along with DHDs? 2) Do we get to see any of the characters make bad judgement calls that effect their personality down the line? 3) Have you read any of the Dark Tower series by King, or the Sword of Shadows series by J.V.Jones? If so, what did you think? 4) Are you at all interested in the Hobbit movies that have been planned? And finally, are there any ways that a UK resident could get hold of a couple of autographs from the current or previous casts of any of the SG shows? All I can say is keep up the excellent work, and I hope to feel as inspired by SGU as I did the first time I watched SG1. Huh a rotate-y Destiny gate on a planet? How does that work? I thought the new date was only on the Destiny, so now in another Galaxy there is another bunch of different gates? Hey Joe you seem to have neglected to make the pics of Elyse clickable. Thanks for the episode title, it sounds great. Dude, the show is looking awesome. Speaking of your writing partner, just how is his last name pronounced? Is it Mull-eye, Mull-e, Mule-eye, Mule-e, or some other variant thereof? with all the background material you provide in the day to day workings of producing a tv series, I wonder if you’ve ever considered teaching some sort of course on the subject. Or perhaps a professor has used your blog as source material. With the added benefit that your blog is also amusing as well as instructive. Thanks as always for taking the time to start work on your next thousand straight posts. What’s the plan when you run out of one word titles? Also is the gate that you have on location for shoots other then at the actual gateroom a static model, or can it do anything? Hope you got all the party favors and cake cleaned up from last evening, dogs could help with some of that. Sounds like everyone had a smashing time. Would love to be watching those episodes with you Joe. Looking forward to Oct. Did they serve popcorn? All the clues you have given us in regard to the new show,, haven’t been able to put it all together yet, on purpose, trying to leave that mystery to be solved til opening night. thanks for the insight. When can we have another party? @anneteldy ,glad to hear you are up and about, be well,,.and a belated Happy Birthday! Hey everyone geeky enough to have a Twitter like me: this just in: David Blue has convinced Ming-Na to join Twitter!!! Make sure to follow her (@MsMingNa)!!! I swear Carl must spend hours each day practicing his faces in the mirror, just in case he runs into you and your camera. Maybe someone should tell him to be careful his face doesn’t stay that way. I’m sorry, Joe, I want something more than a maybe marginally more intellectual but still mostly Paris Hilton in space character, which is about as deep as Chloe comes across in her character description and in the few minor moments we’ve seen of her so far in the trailers. I realize it is asking a lot of trailers, given that the cast is so large, to expect to get anything like a decent feel for, well, any of the characters, really, but whereas I felt mild interest for Eli and Rush, Chloe leaves me cold. I mean, does Chloe serve a purpose beyond love interest for young hero and up and coming military man, Scott? Something more useful than helpless Hottie, there as stand-in for the audience to draw their sympathy as she struggles oh so hard to find a role for herself in a new and cruel, cruel world? I really, really hope the female characters in SGU get a chance to be more than sidekick characters, there to take care of the boys when they get hurt, and diplomatically ask for peace when those silly soldier boys get overly enthusiastic with their military toys, and tend to those brainy boys while those brainy boys figure out new ways to blow up problems and save the day, and and and. I know that the actors came out strongly in defense of their characters at Comic Con, which is all well and good, but I think it’d be nice to see some of those strong female character moments showing up in the trailers, too, and not just the kisses and terrified face moments. Joe – I know I’ve talked about the show before here, but I don’t think I’ve ever asked – have you ever watched the Brit sitcom, Chef! ??? Reason I bring it up is because today I went to the little fair our town has each Tuesday. Today Cherry Grove Farm had a booth set up – http://www.cherrygrovefarm.com/ – and they had a raw milk (unpasturized) blue-veined cheese. Well, it reminded me of an episode of Chef! where the star went on a quest across the English countryside to track down illegal, unpasturized Stilton cheese. I asked the young man at the booth if he was familiar with the show, and to my surprise he was, and knew the episode well! I loved that show – have the boxset, and everything. I bought a wedge of their aged, raw milk Toma Primavera, and fresh, nitrate-free bacon – can’t wait to try it! 369 comments from yesterday. We didn’t hit 1000 but 3-6-9 has a nice sequential feel to it. Nice party. You should make it an annual thing. Subversion, eh? The episode titles are intriguing. I’ll be interested to see how they fit with the plots of the episodes. @Narelle: I remember that “Day in the Life” post. That is how I first found your delightful blog! Hey, once you get all of that inheritance money, you can come visit me. Or better yet, fly all of us bloggers out for a beach party somewhere nice in your part of the world. Woo hoo, indeed! @das: Giant Size Conan with Elric? Scan me that panel! I haven’t read Sailor on the Seas of Fate lately so I’m not sure what the story line is. Let me know how you like it. And are you o.k. after that scary incident with the brakes? Ah darn it, yet again. I missed your big party yesterday with that very yummy looking cake. I was traveling back from Comic con with my son. Living out in the great beyond of North East Alberta meant a 4 hour plane ride to Calgary, and then a 6 hour car ride north. We could have used the airport in Edmonton which is North of Calgary, but there are no direct flights from Edmonton. It was actually easier and cheaper from Calgary. That included a night in a hotel in Calgary. Go figure. I hear that it’s very warm in Vancouver. San Diego was absolutely wonderful. The temperature never went above 25 degrees. It was very hard to leave. @ Sparrowhawk – I’ve scanned the panel – will post at GW, with an explanation as to why I liked it. Sailor on the Seas of Fate is one of my favorite Elric stories because much takes place aboard ships – and you know how I love ships! (The wooden, sailing kind…not the McSheppard kind. ) Stories include his encounter with the other ECs – Corum, Hawkmoon, and Erekose – and ‘the four become one’ to destroy Agak and Gagak, and when he first meets Smiorgan, and the tale of the Jade Man’s eyes. These were some of my favorite stories, until I read The Sleeping Sorceress, then – I think – that became my favorite, but mostly because it really fleshed out Elric’s relationship with Moonglum, and visa versa. Do all of your dogs enjoy riding in the car or do you need to persuade one to come along? My dogs cry with excitement when they can see I’m heading for the car in a non-work way (ie: no suit and flat shoes – when I get new shoes it takes them a while to work out whether they mean work or potential dog involvement) but as soon as they get to the car, Jack jumps in straight away but I have to threaten Ralph with leaving him at home before he gets in. Even to the point where I get in the driver’s seat, shut my door, start the car and have to say, “Ok Ralph. You’ll have to stay at home”. Then he jumps in damn quick. My neighbours find it most amusing. Congrats on 1001 posts! I would have loved to attend the party last night but everyone had gone to bed by the time I showed up. The new trailer for SGU looks amazing! I can’t wait for the Fall. I was just wondering how the weather is in Vancouver? It was 115 degrees here in Arizona today which sounds pretty amazing except that it wasn’t even a record since it hit 121 degrees here in ’95. 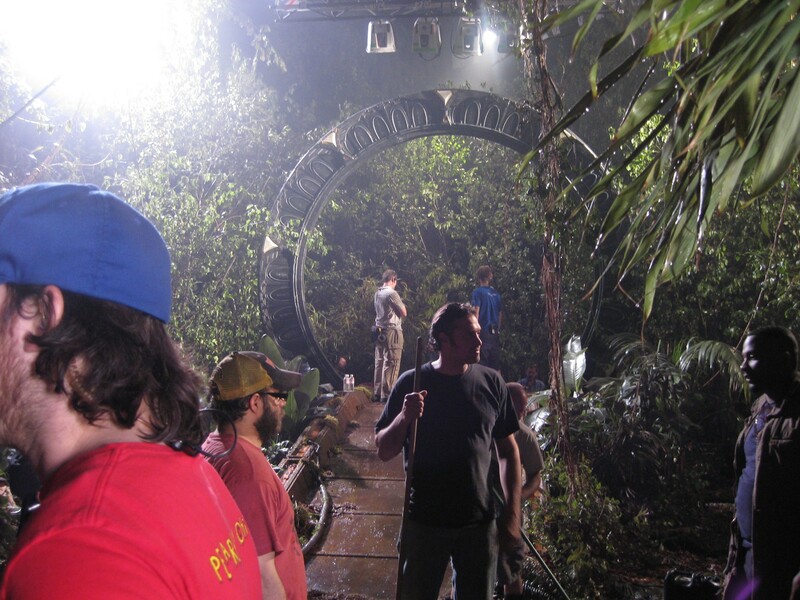 I love the pictures of the gate and the jungle – and Carl’s face again! Does he ever not look like that?! Thanks for the pictures of the beautiful Elyse Levesque too – at first I wasn’t all too terribly excited about her character a few months ago, but now, I’m really looking forward to finding more about Chloe, and David’s Eli Wallace. 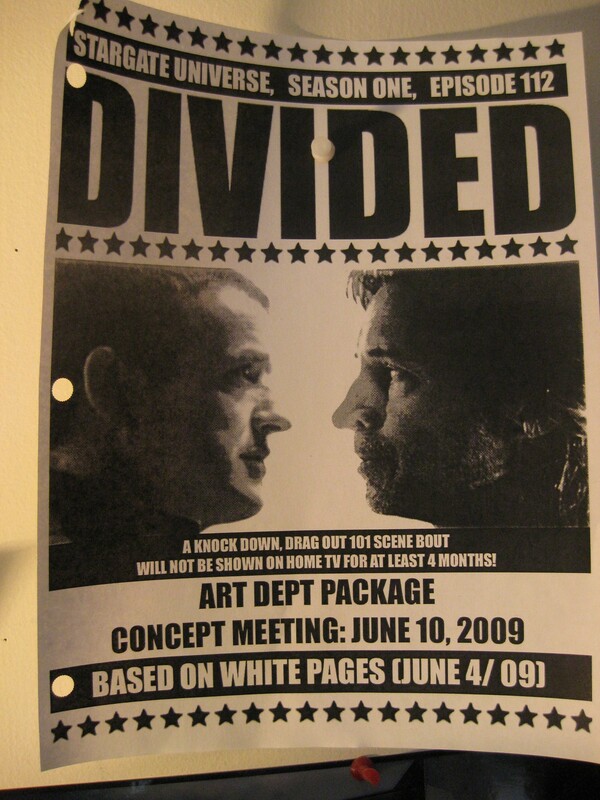 I really like that poster/cover sheet for Divided – do all episodes get something like that? Joe, with it being summer and all (reruns) I’ve decided to pull out my SG1 DVD’s I just finished off season 7 (don’t asked I started off somewhere in the middle of the series). While watching I decided that this time around I’d re watch the commentaries as it has been a while. Some of the comments in those commentaries prompted a question. The impression I got from watching the Heroes 1&2 (GREAT EPISODES, but hated that Janet dies) commentaries was that it was originally only supposed to be a 1 hour episode but it ended up long and the decision was made to add scenes and make it the 2 parter we see now… my question is by making it a 2 part episode did you guys (the producers) have to make a decision to cut another episode that was originally planned? Or is that why season 7 was 21 episodes. Also I know the Lost City we got at the end of season 7 was a revised version of the “movie” Brad and Rob had written years before, how different is what we saw in Lost City from what would have been in the movie? WOW!! !Sorry I missed the Party last nite…..Nice cake and all. Thanks for all the great pictures of late! I’m sorry I haven’t been commenting much. I move in two weeks for grad school–it’s a busy time. As I can see it has been for you as well. I really can’t wait until SGU premieres.